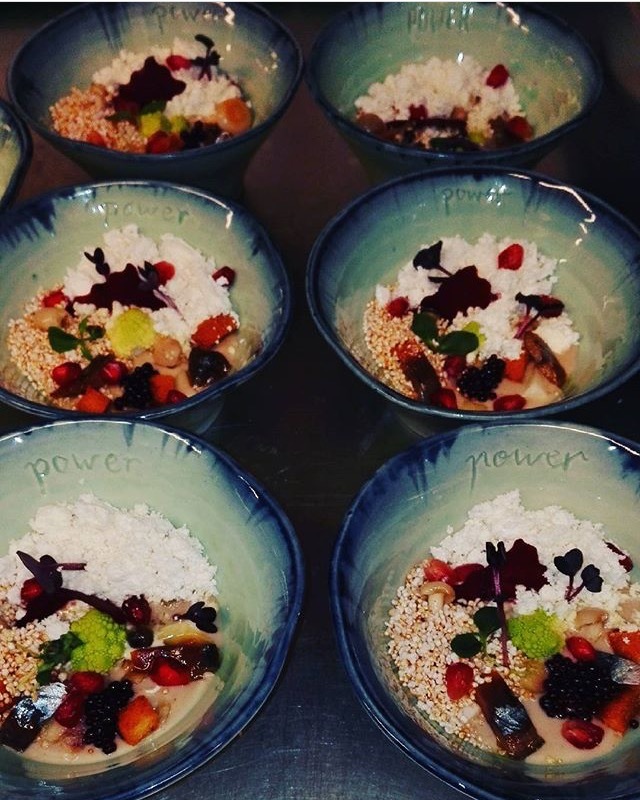 This is a POWER bowl for ReComiendo Power, the Cordoban restaurant by the recognized Spanish chef Periko Ortega and his “perikadas” (his particular dishes). It is an exclusive design to serve his exquisite “mazamorra” (traditional Spanish dish). The aim of this bowl is to transmit the ground-breaking spirit of this restaurant, but with the nostalgy that this cozy place make customers feel. We met Periko while we were having dinner at his restaurant. We loved the appearance of all his dishes and, as usual, we told him that we make ceramics and we would be more than pleased to make a plate for any of his great dishes. And since then, we have worked together every time Periko has an idea to tell us for us to make it real through ceramics. 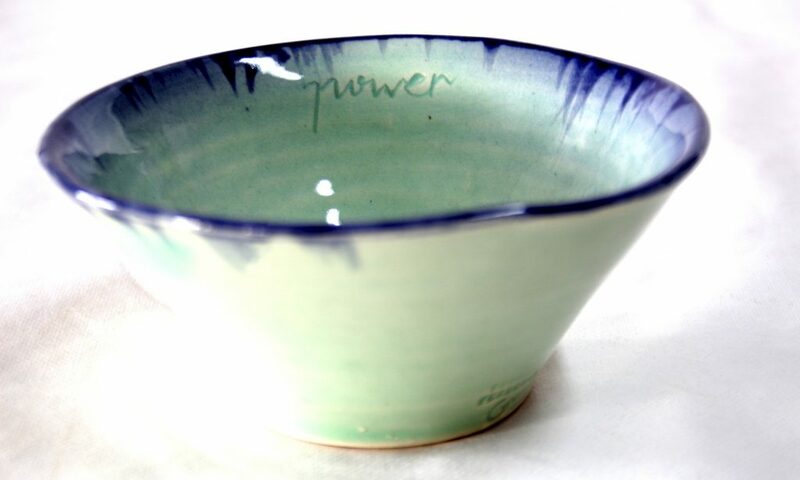 This bowl is the first idea we made for Periko. He was looking for a small functional bowl, of 10 cm diameter approx, and of course having the quality and durability a restaurant should have in plates (oven, microwave and dishwasher safe). Shape, colour and any other detail was up to us… and we love that! We thought of a smart, fine, thin and conic bowl with Asian inspiration and a wavy shape. However, in order to make it seem more natural and light, we gave it an organic and irregular touch in the edge. About the color, after trying several decorations and glazes, we decided to use a mint green with a blast of cobalt blue at the edge, as we were looking for an eye-catching final work, and this was the best way to get a real contrast between the bowl color and the food tonality which is going to be served in it. 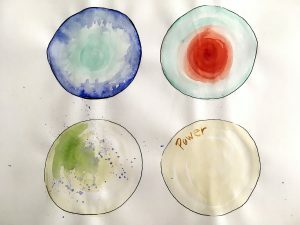 And having all this, we started to work on Torres Ferreras’ potter’s wheel. The irregular touch and the carved logo was made afterwards with leather-hard clay. Both Periko and we liked the result, that is why we keep working together and Periko continues to tell us every idea which is around his head. And we must say that it is a honour for us. Finally, we can only recommend you going to Recomiendo to check it by your own and order their “mazamorra” in the Power Bowl of Torres Ferreras. Do you want to know what other works have we made for restaurants? Then, you should not miss our entry about the flowerpot we designed for a dessert in typical Spanish restaurant Taberna No. 10 in Cordoba, Spain. Is there anything more typical from Cordoba than a flowerpot? This is what the restaurant Taberna Nº 10 might have thought when they designed their dessert in pot, and they counted on us to make it. Maybe you were thinking of a real flowerpot to put or hang from your patio’s walls, and we can also make these as you can see with our exclusive Crisalida Flowerpot design. But for this project, we designed a mini pot for a dessert, with the idea that it looked like the traditional red-clay flower pots that anyone can fin in every Patio from Córdoba. However, we had to use some glaze to make it waterproof and hygienic, as it was designed to be used as a plate for a dessert in a restaurant. 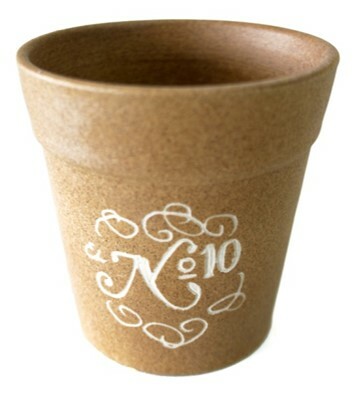 Using a good glaze was the key to make a flower pot suitable for food. 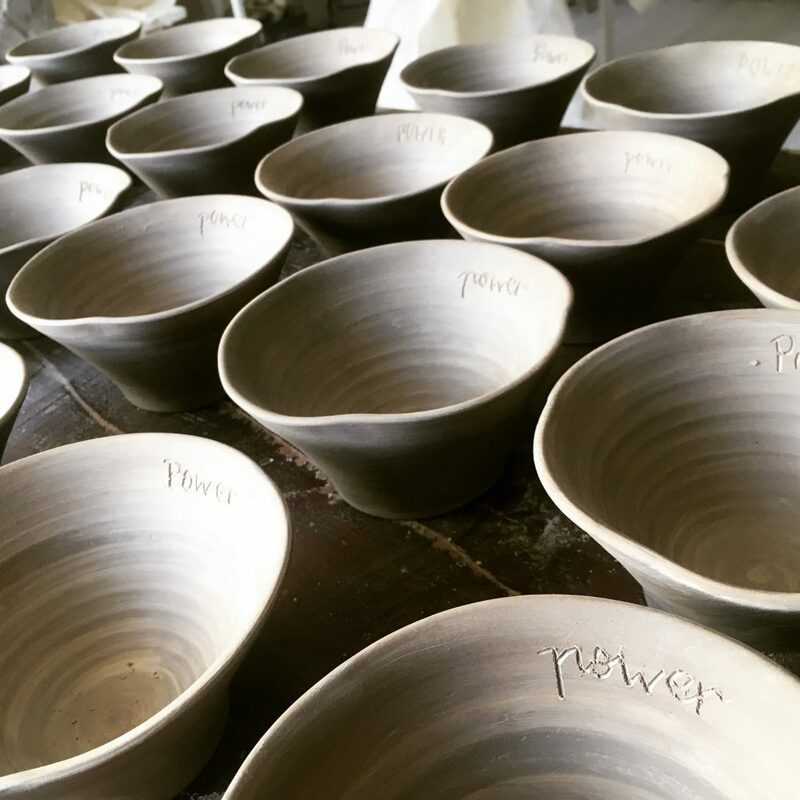 Besides, the truth is that our stoneware material allows us to use high temperature glazes which avoid having pinholes at a 100% and make our pieces completely suitable for their use in restaurants. Furthermore, these glases are leadfree and are oven, microwave and dishwasher safe, which is fundamental in ceramics for restaurants as well. The exclusiveness of this plat lies on the customization of the design by inscription of the restaurant’s logo on the glaze, made by hand with a small graver or “puntilla”, as it is known in the slang of the potters from La Rambla, Cordoba, Spain. 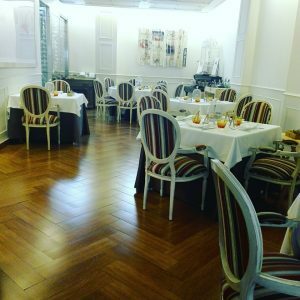 We advise everybody going to Cordoba to stop to have lunch in this “taberna” or restaurant, with a genuine Cordoban environment in which you can enjoy the Montilla-Moriles D.O. wine and, most of all, order the dessert in Torres Ferreras pot! We hope you like the place, the wine, the dessert and our pot as much as we do… Enjoy!